Last weekend seemed to be all about celebrating Taiwan... Not that I'm complaining! I love how the Talking Taiwan podcast keeps me connected to what's going on in the New York Taiwanese American community, and how the opposite happens as well when my involvement in Taiwan-related events leads to Talking Taiwan podcast ideas. 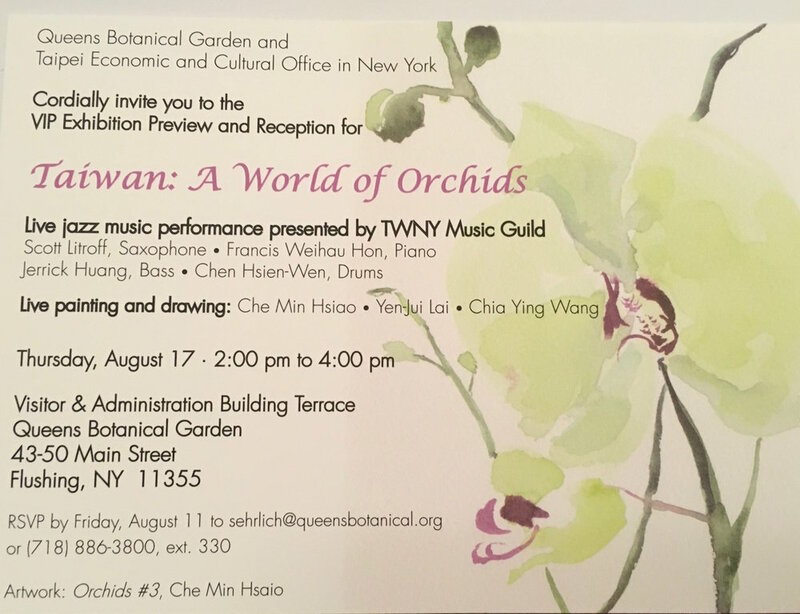 Thursday was the opening reception of the Taiwan: A World of Orchids exhibit at the Queens Botanical Garden. I had been invited by Pauline Huang, the Chairwoman of the Queens Botanical Garden's Board of Directors. I'd interviewed Pauline about the exhibit for Talking Taiwan. I was really looking forward to it because I absolutely LOVE flowers. They are definitely one of my favorite things to photograph. But the one thing I wasn’t looking forward to was the “hike” to get out there. For some reason it always seems like such an ordeal to get to Flushing from Manhattan. It takes about an hour to get there by subway via the good ol’ 7 train. I usually only venture out to Flushing for very specific reasons- i.e. to attend special events or to visit friends who reside there. On top of the one hour of travel time on the subway, getting to the Queens Botanical Garden (QBG) would require a 17 minute walk or a short bus ride. After riding the 7 train out to the terminal stop, Flushing Main Street, I stepped out of the station and up to the street level. I looked around for the Q44 bus, which I knew would take me to the QBG. I spotted the bus in the distance, stuck in the traffic on Main Street, and in that moment knew that I could a catch it if I ran to the next stop where the bus was headed. I sprinted up the sidewalk, got to the bus stop just in time and quickly hopped on the Q44. As the bus drove along, I looked for the Queens Botanical Garden. Walking there would have taken 17 minutes, so I figured that it would be a short bus ride to get there. As I looked and looked, the QBC was nowhere in sight. Could I be going in the wrong direction? A quick look at my Google Map app confirmed it. I had gotten on the right bus number but in the opposite direction! Right away I got off the bus, and walked across the street to take a bus right right back to where had I started. Flushing is not my friend. Needless to say, by the time I arrived at the Queens Botanical Garden I was late for the opening reception. It had not ended yet, but I was definitely late. I arrived at the gates of the QBG, feeling a bit harried, but once I began walking into the garden, those feelings quickly dissipated. I’ve always loved gardens and thought about all the different botanical gardens I’ve visited during my various travels over the years. It’s been a LONG time since I’ve done that. Gardens, parks and vast green spaces have been respites for this weary traveler. As I neared the reception area, I heard the strings of classical music playing in the distance. It was a perfect day for an open-air event. The sounds of Taiwanese folk songs filled the air and several artists painted and sketched orchids. The indoor exhibit featured several varieties of orchids. Click through to see some of my favorites. I also got to witness the artistry of watercolor painter Che Min Hsiao, who was on hand doing paintings of orchids that day. Congratulations to Susan Lacerte (Executive Director of the QBG), Lily Hsu (TECO-NY Ambassador), and Pauline Huang (Chairwoman of QBG)! Sunday was The 13th Annual Taiwan Heritage Day at Mets Citi Field. I'd heard about the Taiwan Day event in past years, but had actually never attended. This year would be my first time attending and I was looking forward to all of the pre-game festivities which included performances by Liu Sheng Ji (留聲姬), a rock/Chinese orchestral band from Taiwan and the Third Prince. The Third Prince is a Taiwanese Taoist deity often seen at temple festivals and street parades in Taiwan. This religious folk icon has been reimagined and popularized as the "Techno-Dancing Third Prince." The first major international appearance of the "Techno-Dancing Third Prince" was probably at the 2009 World Games in Kaohsiung. While I was there I also came across some other interesting characters including “Coffee” the panhandling New York Mets dog. Oh Bear and Mr. Met were there too but somehow Oh Bear eluded me and I couldn’t find him for a photo op. This is the closest I got to snapping a photo of him. Oh well, I guess there’s always next year. All in all I thought that the event was a great way to showcase some of Taiwan’s culture and it was a terrific branding opportunity for Taiwan. During the game, the JumboTron broadcasted Taiwan travel ads, and baseball fans were shown on screen being asked trivia questions about Taiwan. As the host of the Talking Taiwan podcast, I’m always looking to cover events, people and stories related to Taiwan. So I’ll definitely be reaching out to the Taiwan Tourism Bureau to talk to them about Taiwan Day and/or other events that they sponsor throughout the year. If you have a suggestion or show idea for Talking Taiwan, I’d love to hear it. Please feel free to comment below, contact me here on this website or to fill out this form on TalkingTaiwan.com if you’d like to be a guest or to suggest a guest for Talking Taiwan. Talking Taiwan seeks to introduce listeners to the interesting and diverse individuals who make up Taiwan’s global community – in Taiwan, the US, and around the world.